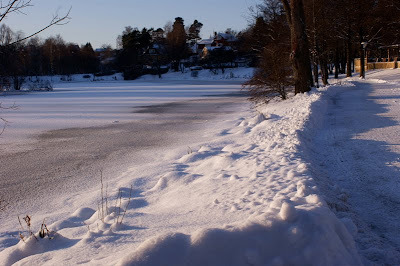 Lötsjön is a shallow lake in Sundbyberg, in fact the only lake in this municipality. Not surprisingly, many birds choose to hang around here. Taking a bath is prohibited but at this time of year most of us wouldn't want to anyway. For every conceivable hobby, there seems to be practitioners. (Also for some of the inconceivable ones.) I did not see any foot patrols out on duty so chances are that a winter bather just might get away with it. I would say incredible, but I think you are right!